LGPA PLAYERS and spectators during tournament at Wilshire Country Club in 2018. For LPGA players, traveling across the country to compete in tour events can be an expensive and, at times, lonely experience. That is why many players take advantage of the LPGA host family program. 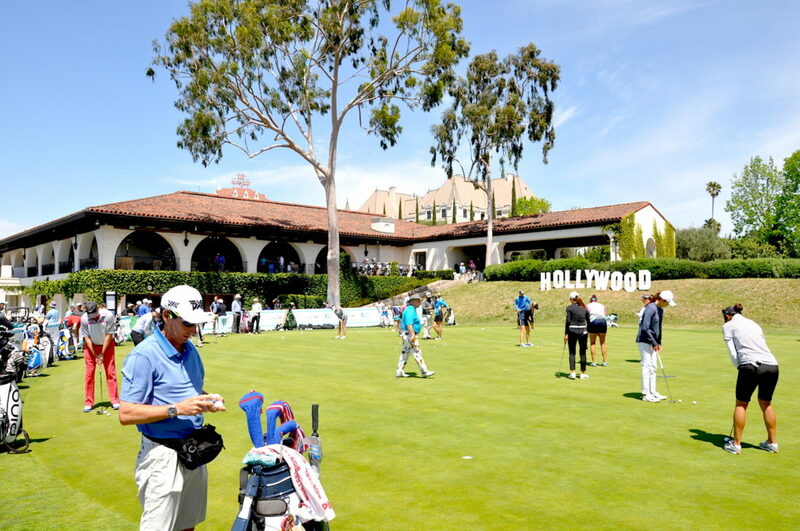 Instead of a cold, corporate hotel room, many players at last year’s tournament found comfort, economic relief and lifelong friendships in the tony neighborhoods surrounding Wilshire Country Club in Hancock Park. Eager to hear a first-hand account, the Chronicle reached out to two families, who hosted players last year, to measure their experiences. “We enjoyed being hosts for three players last year, so much so that we are hosting the same three players this year, plus two more for a total of five,” said Hancock Park resident Bill Ahmanson. “The players are no trouble at all, and frankly, I wish their schedule had more free time so that we can enjoy the pleasure of their company more,” he explained. In addition to the perks of saving money while on tour, players also develop a second family relationship with their host family, often returning to the same home year after year. SOME OF the players from last year’s tournament. Last year, the Ahmansons hosted a celebratory dinner for their players, and invited a few of their friends that are golf fans to join them. “It was great fun and the girls were very accommodating of all of our questions,” said Karla. This year, she is planning a taco night, among other things. Windsor Square resident Vince Chieffo and his wife, Karen Pope, hosted a player last year, and Vince described it as an “amazing experience.” Vince and Karen told the Chronicle that they are looking forward to doing it again this year. “It was a special treat to experience part of the day-to-day life of a professional athlete,” said Vince. One night during last year’s tournament, Vince and Karen were invited to join their player at a nearby Korean barbecue spot for dinner. “The place was full of LPGA players and with all of the table-hopping and goodwill among them, it reminded us of dinners at long-ago away weekend soccer tournaments with our daughters, their teammates and parents,” said Vince.